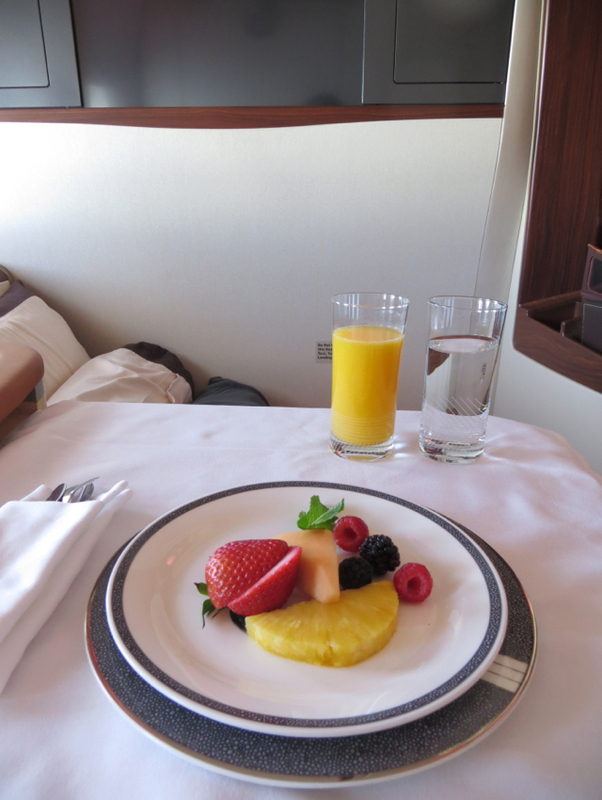 This Singapore Suites JFK to Frankfurt review is part of a trip report including Singapore Suites, Emirates First Class, Asiana First Class and luxury resorts and dining in Southeast Asia. 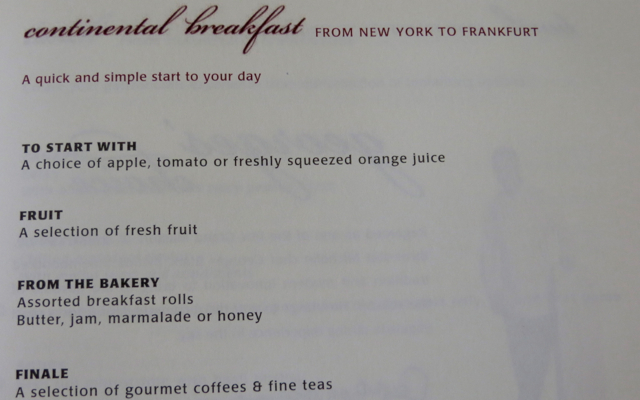 For the first post, please see Virgin Atlantic Clubhouse JFK. While my husband flew Singapore Suites from Frankfurt to JFK last year, I’d never flown Singapore Suites until this trip, so I was quite excited for my flight. I arrived just as final boarding was called, and was the last Suites passenger (although not the last passenger on the flight) to board. I was offered a pre-flight drink, and since I’m not a champagne drinker, I opted for water instead of the 2004 Dom Perignon or the Krug Grande Cuvee. A cool towel was also brought, which was welcome as I’d done quite a bit of running around that afternoon getting ready to depart. I also chose a newspaper from the selections offered. 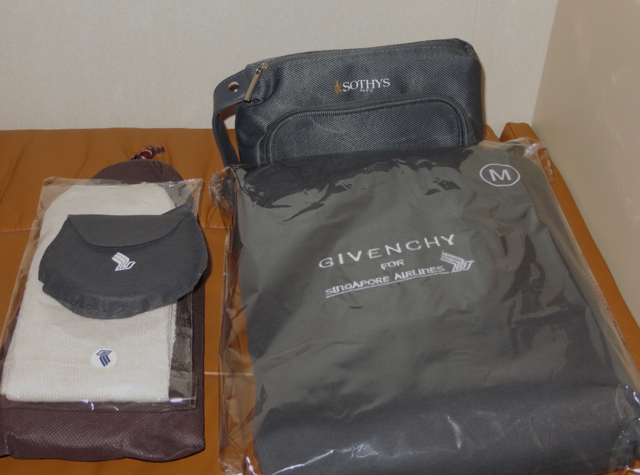 Prior to departure we were also given a Sothys amenity kit, Givenchy pajamas, slippers, socks, and an eye mask. 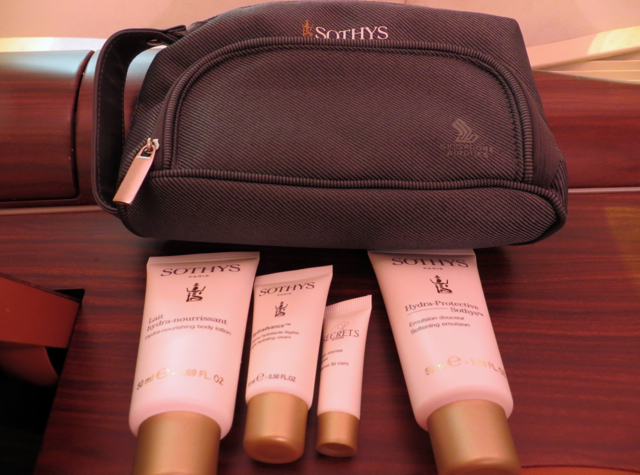 The Sothys amenity kit only contains skincare products, and items such as toothbrushes, razors, etc. are available in drawers in the Suites bathroom. The grey Givenchy pajamas, for which I took a medium, are quite soft, although a bit short in the arms and legs, at least in the women's version. 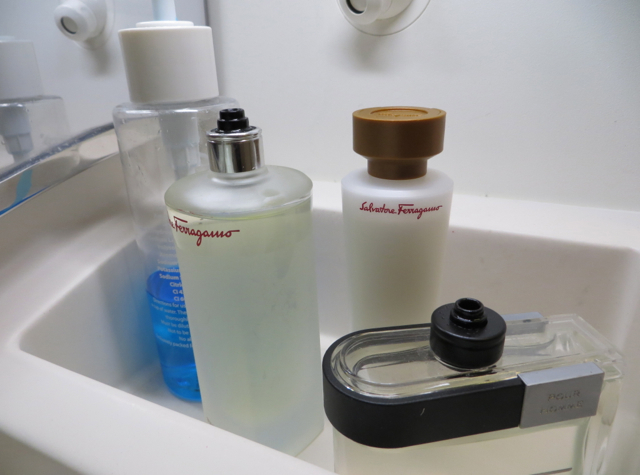 While I would have preferred if Singapore had kept Kiehl's skincare for its amenity kit, which it offered a couple years back, I did end up making use of the Sothys moisturizer since I'd forgotten my own, and it wasn't bad. We pushed back on time and were soon airborne. While I knew the A380-800 was quiet, even I was impressed at how quiet take-off was. It was raining during take off and there was some turbulence intermittently throughout the flight, although it didn’t interfere much with my enjoyment of my first Singapore Suites experience. 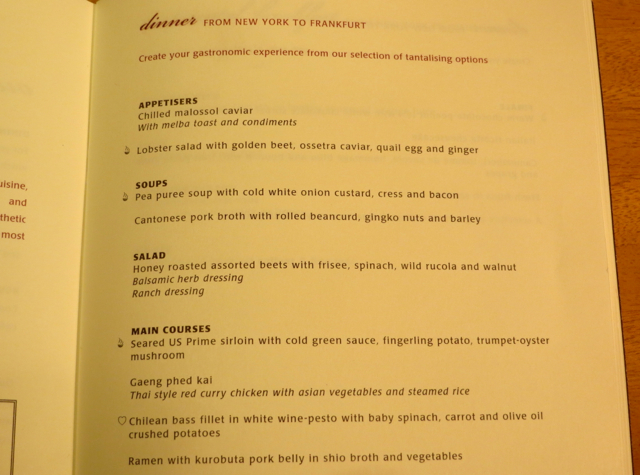 The Singapore Suites menu for that evening highlighted creations by Alfred Portale, of Gotham Bar & Grill in NYC. It featured lobster salad with golden beet, ossetra caviar, quail egg and ginger; pea puree soup with cold white onion custard, cress and bacon; seared US Prime sirloin with cold green sauce, fingerling potato, trumpet-oyster mushroom; and warm chocolate-peanut tart with white chocolate sorbet and banana sauce. 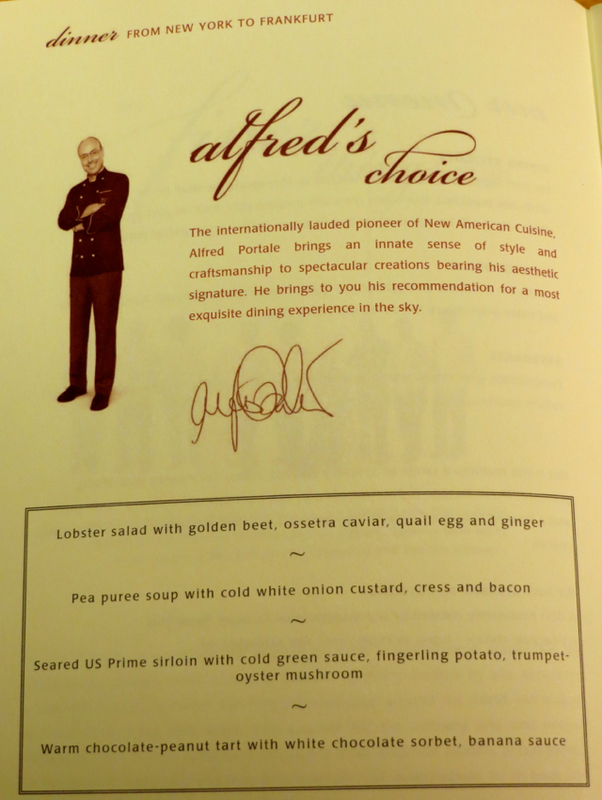 I’d already pre-ordered Lobster Thermidor as my main dish, via Singapore Airlines' Book the Cook option, and I did consider ordering the lobster salad, but in the end went with Singapore’s signature chilled malossol caviar with melba toast and condiments, and decided to forego any soup or salad in order to get to sleep earlier. 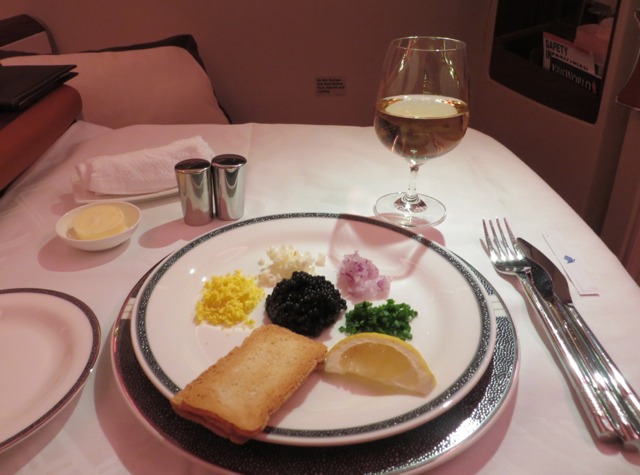 The flight attendant who asked for my menu selection offered to bring a shot of vodka to go with the caviar, which I laughingly accepted, even though goodness knows I haven't had vodka for years, since working in Moscow. 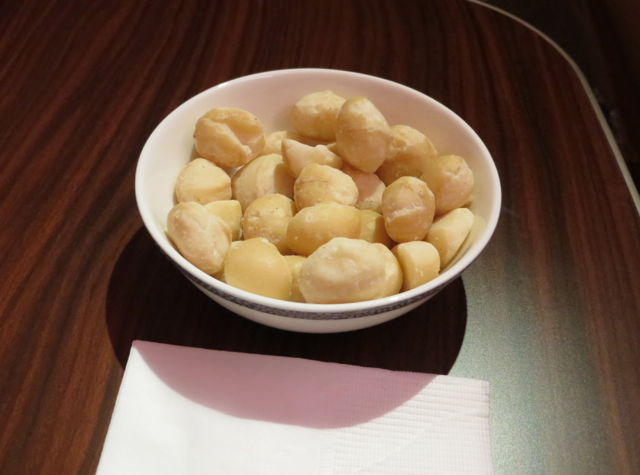 As a pre-meal snack, a choice of macadamia nuts or cashews was offered, and of course, being from Hawaii, I chose macadamia nuts. They arrived warm and were delicious, but as they’re so rich I didn’t finish them so as to save room for the meal. The caviar first course was presented beautifully as always, and was delicious, but I was so ravenous, not having eaten anything since lunch, that I wished I’d ordered the Lobster Salad, as it probably would have been a bit more substantial. There wasn't the promised shot of vodka, but I didn't mind, as I'd selected a glass of Riesling instead. It was on the sweet side, as described, but delicious nonetheless. 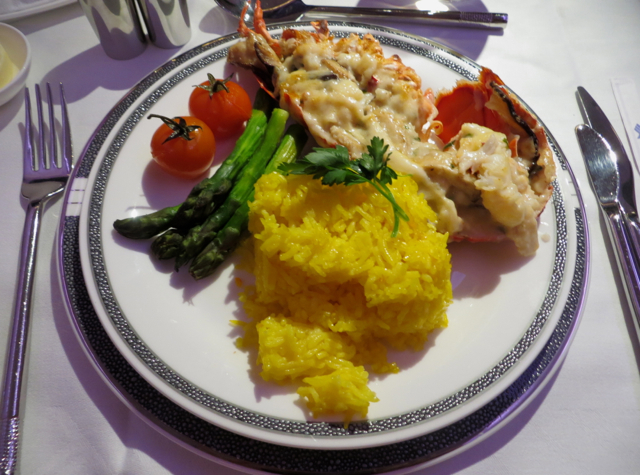 I'd previously heard that the Book the Cook Lobster Thermidor was overcooked and rubbery, but mine was tender and delicious–perhaps helped by the fact that I declined a soup and salad, so there was less opportunity for it to be overcooked. 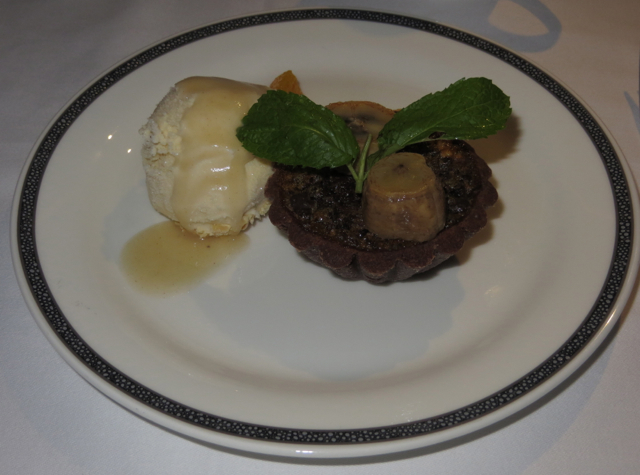 I was still a bit hungry, so I chose Alfred Portale's Chocolate tart (which seemed to be prepared with walnuts, not peanuts) with banana sauce and white chocolate sorbet for dessert. It was served at room temperature instead of warm, as the menu had described, and rather dense and rich, so not my favorite of the chocolate desserts I've had on flights. 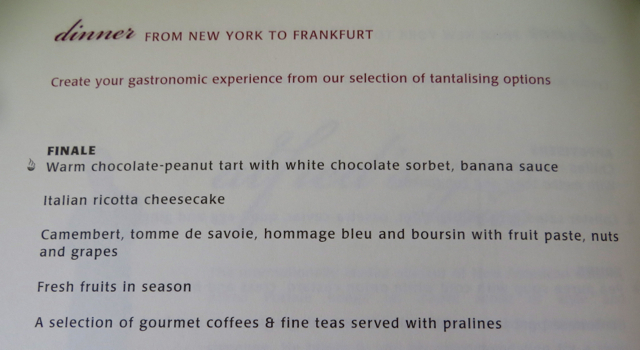 I much preferred the warm, decadent chocolate dessert whipped up by the on-board chef in Etihad First Class. Afterwards, I nursed a cup of peppermint tea while getting some work done. I decided to try the WiFi service, and selected the 15 MB option for $14.99, making sure to select the option to stop service when I reached the limit. Well, within 5 minutes of checking email and a few Web sites I was already at my limit and got cut off. Extremely poor value, in my view. While complimentary WiFi for Singapore Suites would have been nice, at the very least I would have expected longer WiFi access for $15, than just 5 minutes. I realize this is an outsourced service, but I wish Singapore would offer similar pricing to Etihad's Wi-Fly, which I believe is sourced through Panasonic. When initially rolled out, onboard WiFi was complimentary to Etihad First Class, and even now is about $25 for the duration of the flight. After some offline work, I was ready for some rest, and asked if I could have my bed made up, while I went to the bathroom to change into pajamas. 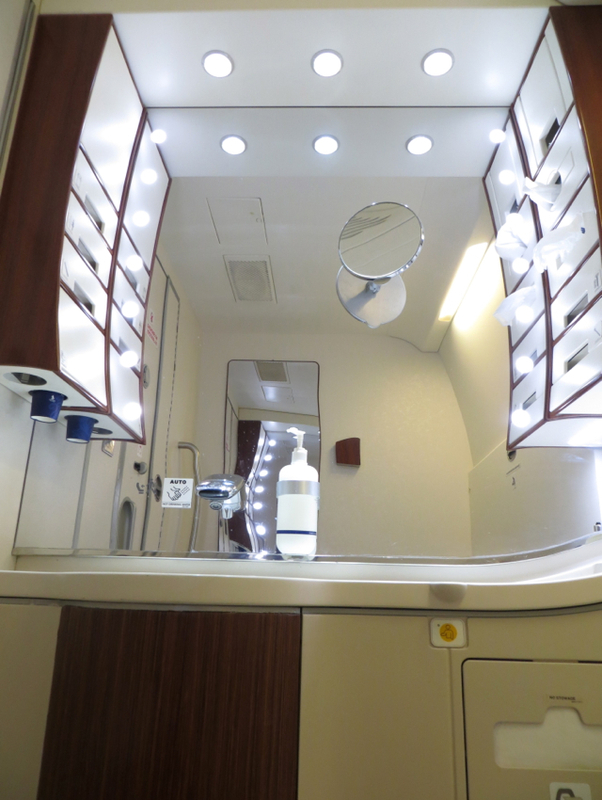 The bathroom isn't quite as large as Etihad's changing room bathroom, but there are film star-like lights around the mirror, and Salvatore Ferragamo toiletries that help make it a step up from the conventional airplane bathroom. There's also a shelf that folds down over the toilet, a nice idea since there's always a shortage of space to put things while you're changing. 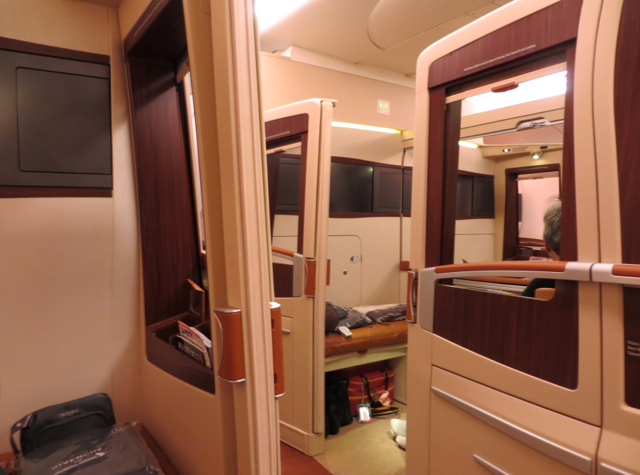 That said, the actual Singapore Suites bed is quite elaborate, which is why you'll definitely want a crewmember's assistance to set it up for you. There's a nice thick memory foam like mattress pad and Givenchy linens. While it's not a Four Seasons bed, and is still best for those that like a relatively firm mattress, it's definitely the best padded first or business class bed I've slept in, with the possible exception of Cathay Pacific old business class on the 747-400, which is quite well padded (although of course very narrow, since it's business class). The Bose Noise Canceling Headphones and a bottle of Evian water were thoughtfully placed to the left of the bed, along with eye shades. 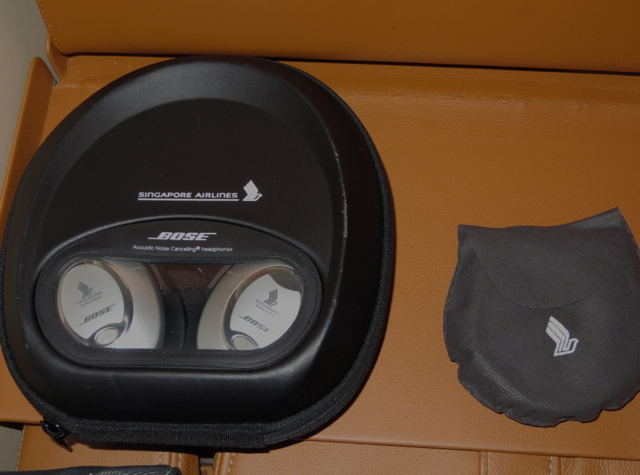 The Bose Noise Canceling Headphones work fine, but what I don't particularly care for are the eye shades–I find that the elastic is too binding and presses it uncomfortably tightly across your eyes. I much prefer the type used by Lufthansa First Class and Etihad with the velcro closure in the back, since it allows you to adjust it to a comfortable size. 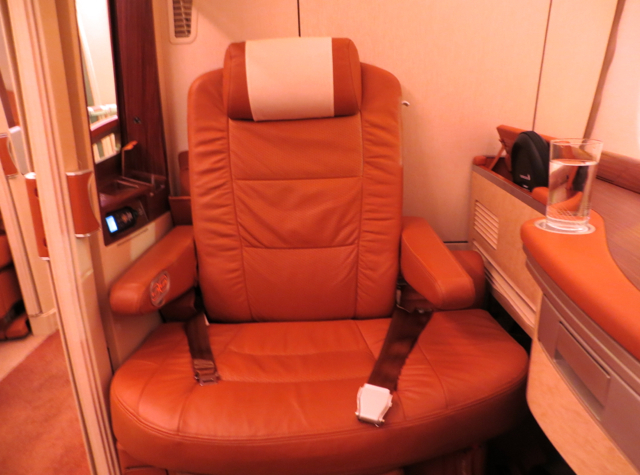 As with Etihad and Emirates, the Suite doors close. It's not complete privacy, however, since of course the top isn't enclosed and the window shades don't close completely, so you probably won't want to use your suite as a changing room, even though there is room by the sliding doors to stand. 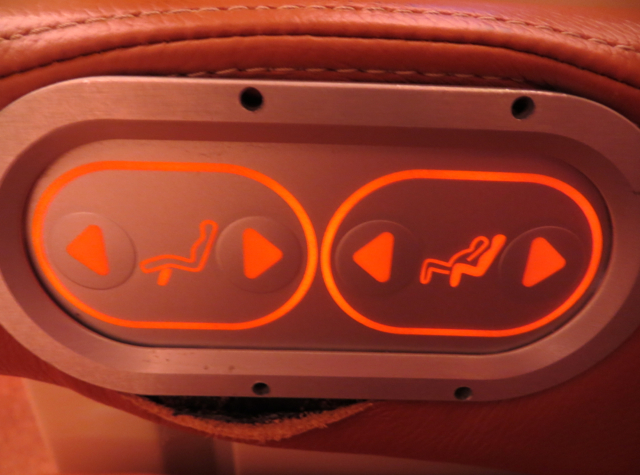 My sleep was a bit fitful, due to the occasional conversation and occasional turbulence, but it certainly was far more comfortable rest than most any other first class product would have offered. Verdict: Was this a perfect Singapore Suites experience? No, but I much prefer some incredibly minor slips and a personable, friendly crew with a happy demeanor than one that might execute flawlessly but be overly formal in their approach. 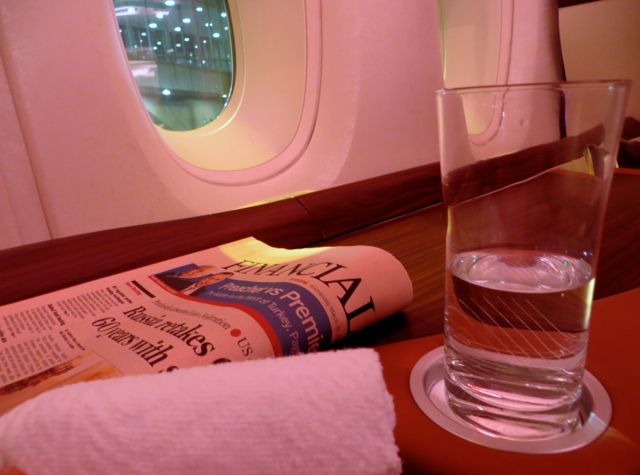 The strongest aspects of Singapore Suites in my view are the service from the hard working crew and the hard product (naturally) with more personal space than, for example, Etihad or Emirates offers with their Suite product. I was more impressed with my Book the Cook main dish on this flight than my prior experience in Singapore First Class, but I still see food and wine as a bit of a weak point with Singapore Airlines compared to some other top first class products. 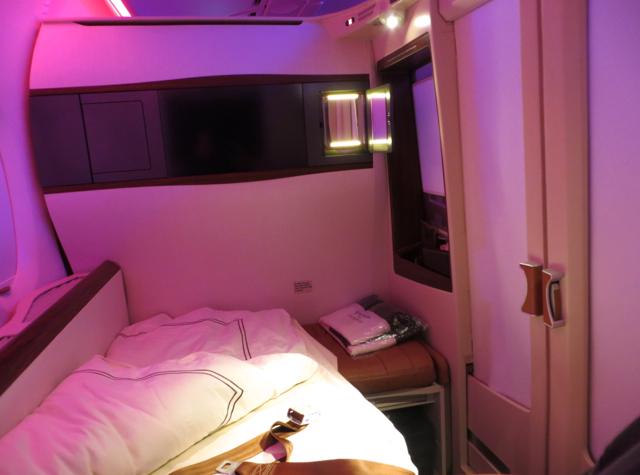 The JFK-FRA flight is short, and over all too soon, so I was very glad that I was continuing on to Singapore to be able to enjoy even more of what Singapore Suites has to offer. 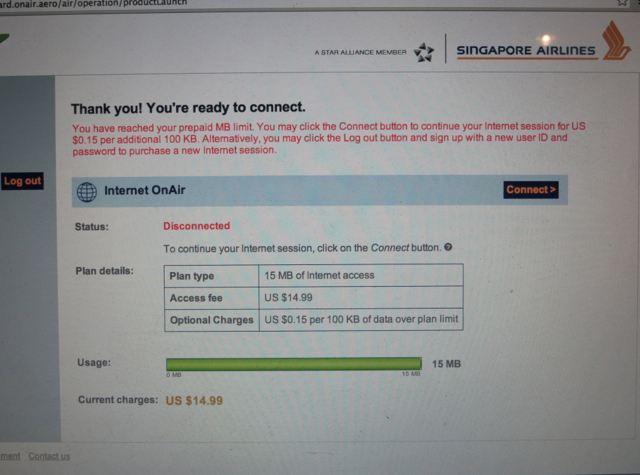 The one aspect I wasn't happy about was how little Internet $15 bought–I basically nixed the idea of any more on-board Internet for my remaining Singapore Suites flights, given the lack of value. 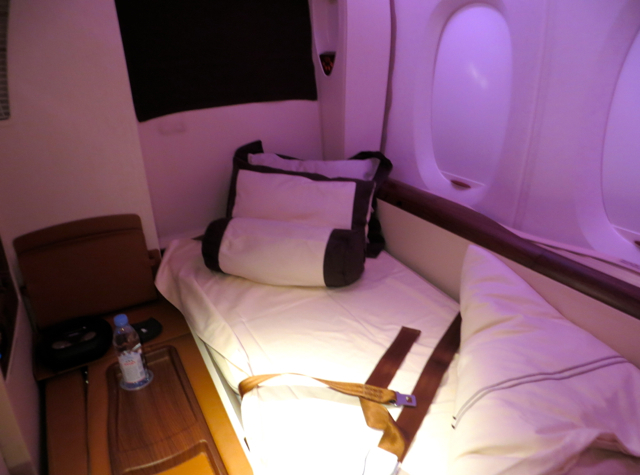 If you've flown Singapore Suites on the A380 from New York's JFK to Frankfurt, what was your experience like?